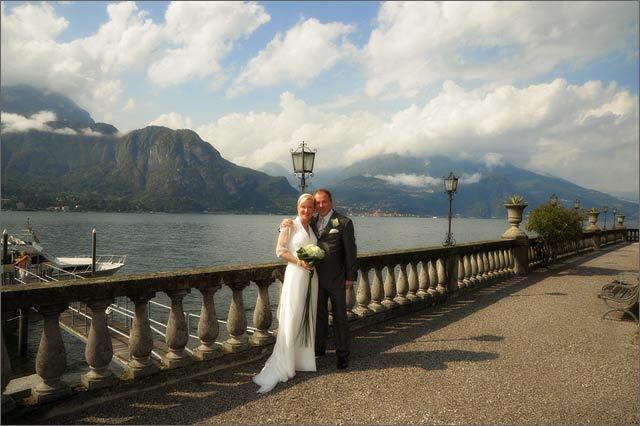 I have to tell you about my latest wedding at Lake Como. It was September 2009 and we only had 16 guests at all. But with a quite good structure of the day, we had lots of wonderful moments. 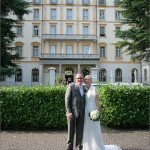 Let me begin with their hotel at Menaggio, Grand Hotel Victoria. 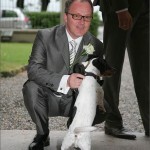 Everybody including their dog was waiting outside for the bride. 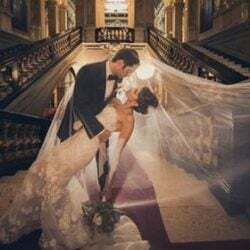 Then she came down the stairs like a queen, kissed the groom and came to me saying: Oh my god, my knees are trembling, without you I would not affront this day today. We hopped on the boat and here the bride Gitte relaxed a bit, had her wonderful bouquet in her hand, her daughter the bracelet made of flowers and for the groom Marcus a nice corsage, all realized by Barbara Botta, Cernobbio. 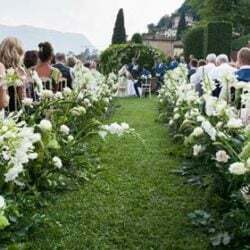 The civil ceremony was inside the library of Bellagio, there ceremony was accompanied by music of the singer Manuela Bonfanti which made it much less strict but much more romantic. 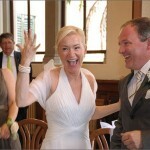 Look how happy Gitte held her ring when Marcus put it on her finger with a very cute personal speech. Even the majors had tears in her eyes. We all walked down the small village of Bellagio for a wonderful brindisi and fingerfood at the splendid Grand Hotel Villa Serbelloni. 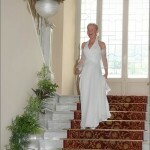 Again here we had the photographers shooting in all ankles of this very historic hotel with all its luxury interior. 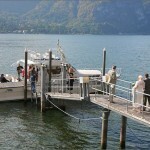 Then back on our private boat we drove to Menaggio for refreshing and some men even had a bath in the lake ! 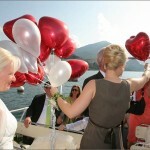 Not to forget to mention, we had some balloons that were set into the sky when we arrived at the open lake. 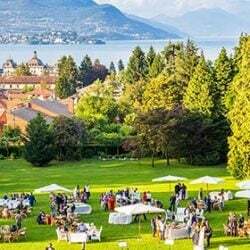 At 7pm there was organized an informal aperitivo in the garden of Grand Hotel Victoria with chilling music from our Band Trio Acustico. And around 8pm we started with the dinner, served in the private atmosphere of the Sala Victoria, reserved exclusively for them. What a happy surprise when the cook himself (very young and smart) presented the white wedding cake at midnight, together with some small firework. After enjoying the cake and the Spumante we finished this evening with letting up the lighted fly lanterns into the pitch dark sky. 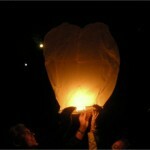 Every lantern went with a wish of luck for this happy and now married couple. When going home at 1h in the morning, I once more was happy and satisfied about all details of the day. 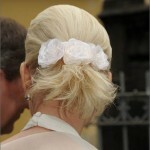 It is so important to have put together a working team of musicians, photographers, translators, dogsitters, florists, hairdresser etc., so the day is flowing by for bride and groom without any trouble or any thought into the organization.